Recognize Driver Safety with Safety Incentives! Many trucking companies are looking to provide safety incentive programs to their local and long haul drivers as part of an overall driver safety improvement strategy. It is no wonder considering that last year alone there were over 135,000 non-fatal collisions reported in the United States. When companies employ thousands of employees who utilize company vehicles, improving their driving safety record is vital to bottom line results. Awards Network Account Managers work side by side with clients in the trucking industry to ensure that each safety incentive program is as successful as possible. All program administration, communication of the safety program and gift fulfillment is performed by Awards Network. Most importantly, safety program reporting is available anytime for program administrators so that the safety incentive program’s effectiveness can be measured and compared over time. A long haul driving company needed to increase safety awareness and compliance on the road in order to decrease the high cost of accidents and insurance. 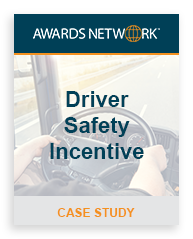 Awards Network designed an online safety incentive program for drivers of the company which allowed employees to access the program information anywhere, anytime. As drivers reached safety goals, they received points which could be redeemed for a safety award or banked for an award from a higher priced collection later on. When points are awarded to drivers they are notified via email along with their unique username and password to access the safety program. Drivers used the safety program website to view information on safety program goals and corresponding point levels, take monthly safety quizzes and check out the safety award catalog. As a result of having the safety incentive program in place for 3 years, absences due to injuries were nearly eliminated, workers’ compensation claims decreased by 40% and the cost of insurance declined by 20%. Driver engagement increased and employee loyalty was raised by 34% over the course of the safety incentive program. Ready to find out how our safety programs can work for your driving company? Contact Awards Network to discuss how our safety incentive programs can work for your organization.